Etihad Airways will cease nonstop flights between Perth and Abu Dhabi from October 1 2018. The end of its daily Perth flights will leave Etihad Airways with services to three Australian destinations – Brisbane (daily with Boeing 787-9s), Melbourne (twice daily with 787-9s and 777-300ERs) and Sydney (twice daily with Airbus A380s). An Etihad Airways spokesperson said the decision to drop Perth was part of an “ongoing review of network performance”. “The cancellation of the Perth route is one of several adjustments that we are making to our network in 2018 in order to improve system profitability,” the spokesperson said in an emailed statement. “Etihad Airways is grateful to the city of Perth and its authorities, Perth Airport, local businesses, the travel trade, and the travelling public for their partnership throughout the years of our operation. Etihad Airways began flying to Perth in 2014 with Airbus A330-200s, before upgauging the service to Boeing 787-9 equipment in 2016. In 2015, the airline said it had been “thrilled” with the performance of its Perth-Abu Dhabi flights. However, in recent years there has been an increase in competition from the likes of Emirates, which has boosted capacity through the use of the Airbus A380, and Qatar Airways, which began serving Perth in 2012 and also plans to use the A380 to Perth from May 2018. And in March Qantas commenced its Perth-London Heathrow nonstop flight with Boeing 787-9s. Further, Singapore Airlines (SIA), which competes for passengers travelling to Europe, is bolstering its offering on Perth-Singapore from May when it deploys the 787-10 with its latest cabin products, including lie-flat beds with direct aisle access in business class on the route. An analysis of the Australian government’s Bureau of Infrastructure, Transport and Regional Economics (BITRE) figures showed Etihad carried 86,367 passengers on its Perth-Abu Dhabi flights in the six months to January 2018. This was down three per cent from 89,126 passengers in the prior corresponding six-month period to January 2017. The end of nonstop flights to Perth is the latest in a series of network changes at Etihad Airways as part of efforts to improve its financial position under chief executive Tony Douglas, who took the reins in January 2018. It is ending flights to to Ho Chi Minh City in Vietnam at the end of August, while service to Edinburgh, Scotland will cease in September. Previously, the airline has also withdrawn from Dallas/Fort Worth and San Francisco, and reduced frequency on its nonstop Abu Dhabi-Los Angeles schedule. 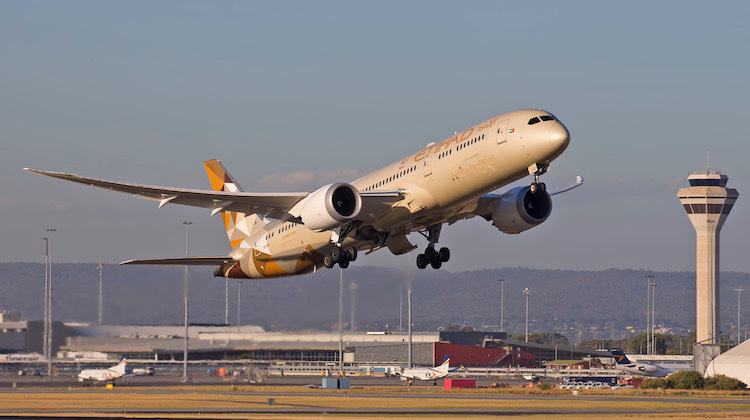 “Etihad Airways is committed to the Australian market and continues to offer regular schedules to its key gateways across Australia through Sydney, Brisbane and Melbourne, all of which are major markets for the airline,” the Etihad spokesperson said. Etihad Airways’ investments in other airlines, a hallmark of former chief executive James Hogan’s tenure as chief executive is also under the spotlight, given the collapse of airberlin and ongoing financial difficulties of Alitalia. Etihad Airways in 2017 sold off its shareholding in Switzerland-based Darwin Airline to Slovenia-based Adria Airways. In Australia, Etihad Airways holds a 20 per cent stake in alliance partner Virgin Australia and has a seat on the Australian carrier’s board. Its other airline investments include India’s Jet Airways, Air Seychelles and Air Serbia.